decisions; while Republicans are about evenly split (46% to 43%) on this. In May 2004, half (49%) of American voters said President Bush’s faith made him a strong leader while only 36% said it made him too closed-minded. Today, voters have reversed their opinion about the role Bush’s faith: 50% now say it makes him too closed-minded and 34% say it makes him a strong leader. And while in 2004 only 27% said that Bush’s use of his faith did more to divide the country rather than unite it, today, 43% feel that way. While Democratic voters (66%) are much more likely to say that Bush’s use of religion has divided America, only 16% of Republicans feel that way. On the religiously-charged “hot button” issues of gay rights and abortion rights, Democrats and Republicans clearly differ. A pro-gay rights candidate makes 59% of Republicans less supportive of a presidential candidate and 13% more supportive. The same pro-gays rights stand makes 40% of Democrats more supportive and only 23% less supportive. The same pattern emerges on abortion rights – but stirs Democrats even more. 49% of Democrats become more supportive of an abortion rights candidate and 26% become less supportive. By contrast, 57% of Republicans feel worse about an abortion rights candidate while 22% feel better. Democrats and Republicans view religious issues differently, and Democratic candidates should show the backbone to stand up for what Democrats believe. When they try to do otherwise, they are not picking up any new votes. In a year in which the Republican alternatives weren’t so bad this might lead to independents such as myself sitting home or looking at third parties on election day. Despite all the talk of religion by Democratic candidates, most do not believe they are religious. 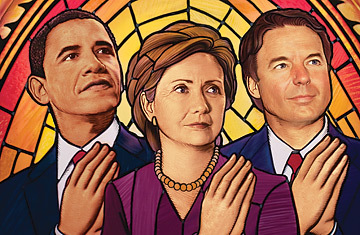 Only 15% of registered voters believe that Hillary Clinton is strongly religious, 22% believe John Edwards is and 24% believe Barack Obama is strongly religious. 24% say they know Hillary Clinton is not religious. Republicans have often won due to demonstrating they have a clear set of values, even if their values have been the wrong values. In contrast, it has often been difficult to determine what Democrats have stood for. Here is a clear difference in the views of Democratic voters with regards to recognizing that religion is a personal matter which should not influence government policy. If Democratic candidates were to take the lead and stand up for the principle of separation of church and state, as opposed to trying to pick up a few votes by unsuccessfully trying to look like Republicans, they might even win more voters over to their position and pick up a few votes. The daily reading of virtually everyone under 40 — and a fair few folk over that age — now includes a blog or two, and this reflects as much the quality of today’s bloggers as it does a techno-psychological revolution among readers of news and opinion. Some blogs have become the best check on monopoly mainstream journalism, and they provide a surprisingly frequent source of initiative reporting. As an example, the only hope of staying sane in the lockstep stereotyped reporting of the 2000 presidential campaign was to look up Eric Alterman on MSNBC.com and the Daily Howler hilariously documenting the false narrative into which every story about Al Gore was fitted. Probably nothing better contrasts the pre- and postblogospheric worlds than the Whitewater and CIA leak stories. In one, the endless repetition of meaningless gibberish was allowed to take root and become conventional wisdom. In the other, despite the constant reiteration of abject fantasies like “no underlying crime was committed,” the public seemed to realize that it’s not okay to perjure yourself in front of a grand jury and obstruct justice on behalf of your boss. Special counsel Patrick Fitzgerald was allowed to try his case in court before GOP spinmeisters could try it in the press, and a recent Gallup poll shows that 66% of the country thinks Bush should’ve left Scooter alone to do his time. In politics, supporters of a candidate or party are increasingly dissatisfied with simply putting up yard signs or making scripted phone calls; they want those in power to listen and respond to them as well. They also don’t trust professional politicians to do what is right without constant supervision. In many ways, these are the characteristics of any insurgent political movement, but blogging is enabling particularly rapid mobilization and organization. We’ve already seen the effects on the Democratic Party. Web sites such as Daily Kos and MoveOn.org — which I find fascinating as models of online activism — have made it quite clear that their aim goes beyond stopping President Bush; they’re also targeting leaders in their own party viewed as unresponsive to the grassroots. Sen. Joe Lieberman’s primary loss is the most visible example. If Republicans remain out of step with their base for too long, expect a similar insurgency on the right. I read blogs every day, for all sorts of reasons, but I turn to blogs especially when I want to hear alternative viewpoints — for example, information on a particular medical treatment from the viewpoint of patients receiving it, rather than doctors administering it; reports from the battlefield seen through the eyes of soldiers rather than politicians; thoughts on a particular technology from the standpoint of engineers rather than executives. Consider the Iraq occupation — or colonization. Corporate media provide saturation coverage, but often manage to leave all the most interesting bits for bloggers, such as what our government is actually trying to accomplish by occupying Iraq (blog.zmag.org/ttt), what Iraqis think about the occupation so far (afamilyinbaghdad.blogspot.com, iraqblogcount.blogspot.com), how our soldiers feel about it (cbftw.blogspot.com), and how taxes being appropriated for it are being doled out (www.huffingtonpost.com). On global warming and reducing our reliance on oil imports, stories in corporate media tend to reinforce the status quo, dwell on political impracticalities of making changes, or focus on pork-barrel nonsolutions like ethanol. Turn instead to quality blogs on the subject (like cleantechblog.com, or Amory Lovins’s blog at green.yahoo.com) and you quickly learn that excellent solutions are at hand, but are being mostly ignored because they aren’t popular with certain large corporations and their representatives in Washington. With millions of private citizens now blogging, there is a diverse and not-easily-censorable chorus to sound alarms, something the corporate media often will not do. In fact, I think our “citizen journalists” in the blogosphere protect us against abuse of power to a far greater degree than the much ballyhooed “citizen militia” afforded by gun ownership — without the daily carnage of accidental and impulse shootings. Just like with Hollywood celebrities, the blogosphere has its A-list. Celebrity in Hollywood might be measured based upon number of magazine covers one receives, while in the blogosphere it comes down to links. A common side effect of blogging is the development of an obsession to look at our site meters and Technorati rankings to see where we fall. While there are clear limitations to any method of ranking blogs, most bloggers, or at least those of us who do it regularly, want the positive reinforcement that someone is paying attention to what we write. In the final group we see what might be considered the blogging elite. This group, which represents more than 4,000 blogs, exhibits a radical shift in post frequency as well as blog age. Bloggers of this type have been at it longer – a year and a half on average – and post nearly twice a day, an increase in posting volume of over 100% from the previous group. Many of the blogs in this category, in fact, are about as old as Technorati and we’ve grown up together. Some of these are full-fledge professional enterprises that post many, many times per day and behave increasingly like our friends in the mainstream media. As has been widely reported, the impact of these bloggers on our cultures and democracies is increasingly dramatic. Technorati rankings are based upon the number of other blogs which link to your blog in the past six months. I waited a few days to comment on this as Technorati rankings are a bit like playing Chutes and Ladders. Often we have a post which receives a lot of attention and many link to it, helping our ranking shoot up. Over the next six months, some of those who linked to such a post will link to us again, but others won’t. Sometimes we see a drop six months later, and it is certainly possible Liberal Values will fall below 500 again. Liberal Values shares some of the characteristics listed above, while not others. We achieved this ranking more rapidly than the average year and a half, but that is partially due to brining in hundreds of daily readers after having had blogged elsewhere. I do blog more than twice a day, but this varies between new writings and posts which are largely quotes from other sources with brief comments. While some blogs are “full-fledge professional enterprises,” I have my own non-blog professional enterprise to run which limits my time and necessitates the use of posts which are partially quotes and links. I’ve never felt too bad about that as sites from Drudge Report to Atrios rely even more than I do in linking to others. Another change of consequence is that, while back in November there were over 4000 blogs in this category, now there are over 6000. Back when I started Liberal Values last August Technorati was ranking less than two million blogs. Now they rank about eight million. WIth more blogs around, it is easier to accumulate links and perhaps the threshold for an A-list blogger should now be higher than 500. Another question is the nature of the links. Many liberal or conservative blogs gain links primarily from other similar blogs, requiring a greater percentage of links from the larger liberal or conservative blogs to reach 500. Liberal Values doesn’t completely fit the mold of liberal blogs. Many of our links come from science bloggers, libertarians, science fiction fans, and others who do not typically link to the larger liberal blogs. On the one hand, this means that our links often come from smaller blogs than the typical large liberal blog. On the other hand it means a greater depth of readership than those who primarily read liberal blogs. While the links here often do come from smaller blogs, there are still plenty of large liberal blogs linking here. Sites such as Memeorandum and Megite consider “quality links” as opposed to number of links and link to Liberal Values on a regular basis. All in all, breaking a Technorati ranking of 500 means less than it did a year ago, and making the A-list isn’t as hard, but this still isn’t a bad accomplishment for a blog that is less than a year old.